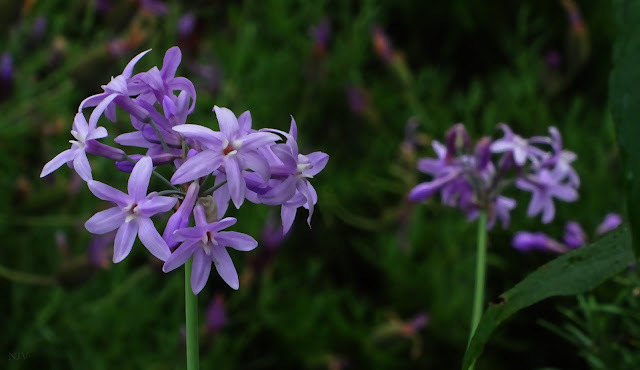 Tulbaghia violacea, also known as society garlic or pink agapanthus, is a species of flowering plant in the onion family Alliaceae, indigenous to southern Africa (KwaZulu-Natal and Cape Province), and reportedly naturalised in Tanzania and Mexico. Growing to 60 cm tall by 25 cm wide, it is a clump-forming perennial with narrow leaves and large clusters of fragrant, lilac flowers from midsummer to autumn. When grown as an ornamental, this plant requires some protection from winter frosts. It has gained the Royal Horticultural Society's Award of Garden Merit. Montana has a flower called the nodding onion with a similar appearance, yet in white. So interesting that the simple 'onion' would have such dandy flowers.